A combination of traditional yoga poses, Pilates and dance with the use of an aerial hammock, Nay’s aerial yoga defies gravity and allows you to perform various yoga poses that may be difficult to do on the ground, but easier in mid-air. It’s fun and acrobatic. Among its many physical benefits – Increasing flexibility, healing back problems, increasing strength, improving balance, aids digestion and can even improve memory! Aerial Yoga can also help improve many aspects of everyday life, including building confidence and overcoming fears. It allows a change in the physical perception, It brings out a light playful energy with feelings of the child within. 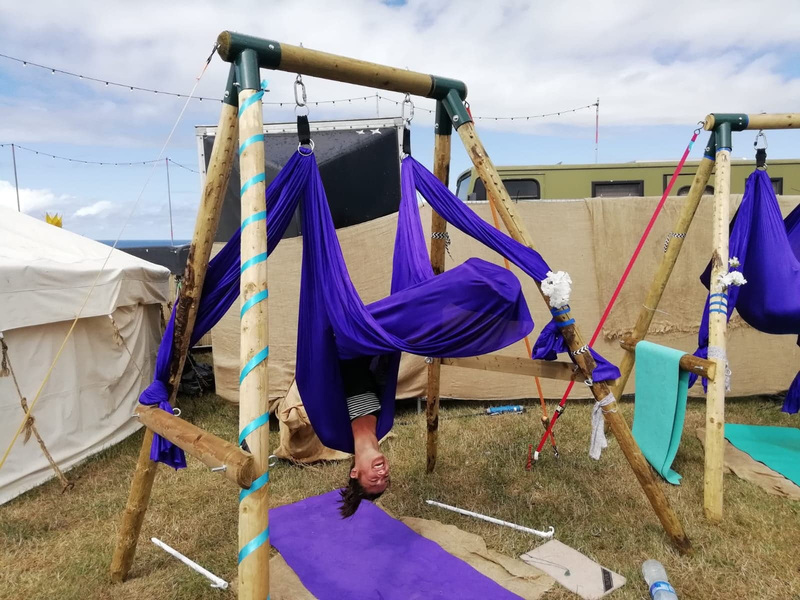 What better place to try this new magical yoga practice than at The Great Estate festival!, Just look for the gorgeous hand made wooden Aerial yoga frames. Only 5 places available per time slot! Aerial Yoga is designed for all ages and abilities with a full range of body movement, welcoming ages 10 and upwards, (Kids groups under 10 years can be discussed with Nay )not suitable for those who have high blood pressure,recent severe muscular or bone injuries, or are prone to feeling dizzy or sick when upside down.